This Cork Board Comes with Chalkboard in a Metal Frame for Wall Mounting! This Cork Board Is a Bulletin Board with a Tray for Accessories and Is Ready for Purchase Online! 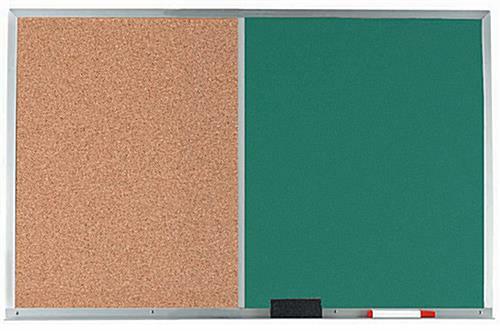 This classroom cork board incorporates a combination of corkboard and green chalk writing surface. Full dimensions are 72" wide x 48" high. (Chalkboard: 36" x 48"; Corkboard; 36" x 48") The aluminum frame renders a steadfast unit and furnishes a good seeking border. Includes storage tray to handily hold your chalk and eraser. Ships with a box of chalk and eraser. Mount the unit on your wall with the pre-attached brackets...looks outstanding and furnishes tons of area to post memo's and hand write your subject matter in chalk. This size is the most popular in our educational facilities, most requisitions are for numerous units so they can outfit all their classrooms.